We went blueberry picking this morning. The sun was shining, the blueberries were plump and sweet, and the fine young gents were happy. It was quiet except for the hum of contented conversations up and down the rows and the occasional plane overhead. "Oook! Oook!" shouted the youngest gent each time he saw an airplane. The older boys ran up and down the rows of berries while the baby helped me by dumping my blueberries into the big bucket and feeding me green blueberries. We saw an empty bee nest and a grasshopper. It was perfect. Berries to freeze when we got home, strawberries from the farmer's market and blueberries from our outing. I picked through the blueberries to take out the stems and leaves and spiders. Now I've got a freezer full of berries for smoothies and pancakes and ice cream topping. A bit of sweet summer to brighten our winters. I didn't freeze them all, as you can see. I tossed some berries in a bowl with some sugar, cornstarch, lemon juice, dash of cinnamon and salt. I even had a few blackberries left to throw into the berry mix. 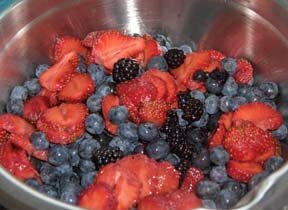 A cobbler tip (recipe below): Cook the berry mixture first until the berries are bubbling hot. Plop the biscuit mix on top of the hot berries, raise the temp in the oven, and cook until the biscuits are brown on top. The berries get perfectly done and the biscuits are moist inside and crisp on the outside. 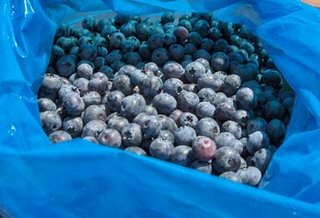 On the way back from the blueberry farm, my husband and I talked about choosing perfect days. Of course the berry field wasn't perfect in the sense that there were no flaws, or that every single thing was pleasant. The grass was itchy and made me break out in a rash. There were spiders, the baby kept getting in the way or trying to wander off, and the other young gents ate too many berries and cried when they fell down. I can't pretend the annoying stuff doesn't exist, as though I am a child plugging my ears and singing "Lalalalalala." The day is the same day, itchy grass and warm sun together. But when I come home I pick through the day to discard the stems and leaves and spiders, the itchy grass and little fusses of the day, and think instead about the sunny berry field and watching the planes and playing with my boys. I've finally realized that the stories that we tell about our lives help to define and create the lives we lead. I get to choose the parts of the story I want to make most real. When I retell the story of my day to myself,I can choose to let petty things go. I choose wonderful. I didn't always know how to do that, how to let go of all of the little fusses. I nursed grudges and clung to grievances and complained about the itchy grass in my life. I still do, I'm not perfect. To be fair, thinking about the itchy grass in our lives can be useful: Next time I go berry picking I'll wear long pants or bring a blanket. And we can't live in the "perfect" every day. The days where the cat throws up and the gents fight and the lovely ladies burst into tears when I say "Good morning" and my husband grumps and I feel like I've yelled all day long. Not perfect. Flat tires and broken windows and dysfunctional relatives (um, not you guys, just those other relatives...yeah, the ones that don't read this blog...) and flooded toilets and stupid arguments happen, and far be it from me to tell anyone, myself included, "It's all good." But why did it take me so long to realize that I can't let those things take over the stories of my life? Just lately I've realized how quickly the time flies by. The baby I rocked yesterday is tall and beautiful, dancing her way out of girlhood. Tomorrow I'll be rocking my grandbabies thinking "Where did my life go?" I wish I'd learned sooner to choose happiness over regrets, and to choose contentment over resentment. Today I will choose to remember the blueberries and sunshine. I will give the people I value the grace and love they deserve instead of grumping about their faults, and I will extend that grace to myself. I will treasure the wonderful moments of my life and theirs so that when I rock the babies of my babies my stories will be of picking blueberries and running through the sprinkler and reading good books and laughing in the hammock. A little vanilla ice cream on top....Mmmmmmmmmmmmmm. Pour the mixture into a square baking dish or a glass pie pan. 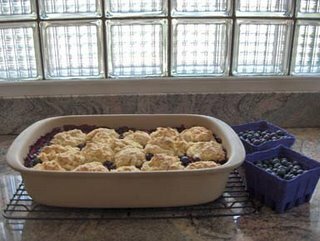 (For a larger cobbler, double the recipe and use a deep 9x13 dish.) Put the dish onto a rimmed cookie sheet to catch drips, and put it in the oven for 20-25 minutes, until the berries are hot and bubbling. When the berries are bubbly, mix the wet and dry biscuit ingredients, then take the berries out of the oven and drop spoonfuls of biscuit onto the hot berries. Turn up the oven temperature to 425 degrees, return the cobbler to the oven and bake until the biscuits are golden-brown, about 15+ minutes. Serve warm with vanilla ice cream on top. That was a lovely post! So very true. I'm going to try this for today and see if I can make a habit of it! Cat, your words flow like a stream of the clearest, purest water I have ever seen. And while I do recognize that sounds a bit dramatic, your thoughts brightened my day in a profound manner......and it is something I hope to remember and LIVE each and every day.